When I started this post last night, the highlight of the day was going to be the cooking class we took at Cafe Clock in the Medina. Souad, the chef, was indeed wonderful. 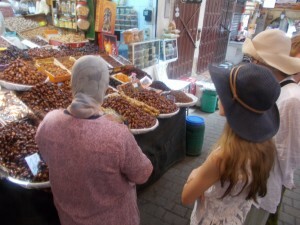 We started by picking a menu and than shopping in the medina’s stalls. The chicken stall was a bit rough for the girls but if you are going to eat it…. the act was very swift and we returned later for the bird in a more ‘A&P’ form. The cooking was straight forward and the results were tasty. That was supposed to be the highlight of the day but…. Enter Sayed. At 5′ tall and about 100 lbs, he is perhaps the skinniest and fittest human I have ever seen. He arrived to give me a Hammam rubdown cleansing massage. To say that he was ‘thorough’ would vastly minimize this man’s attention to detail. Not since my mother washed me in the kitchen sink at the age of 6 months old have I been as squeaky clean as I was after an hour with Sayed. Though the ‘Brillo pad’ treatment during the middle 25 minutes did cause visions of blood running in the drains, it was a supremely satisfying and invigorating experience. Feeling like a combination of Superman and Adonis last night, I was dismayed to wake up this morning as myself. It was a crushing fall but hey, I’ll take the one night and an unforgettable experience. Oh yes, I almost forgot….it was 107 degrees in Fes today.